Book Review: 'I Got Schooled,' By M. Night Shyamalan Filmmaker M. Night Shyamalan puts forth his prescription for America's educational system in I Got Schooled. Reviewer John Wilwol says it's a "breezily written, research driven" book that debunks common myths about education in Shyamalan's distinctive — if flawed — voice. 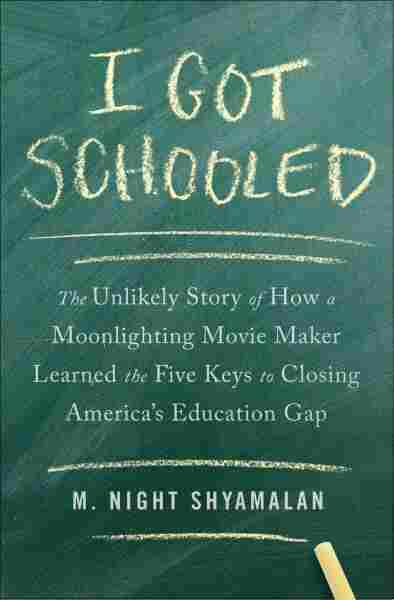 While researching his buoyant, impassioned (and thoroughly subtitled) new book about education, I Got Schooled: The Unlikely Story of How a Moonlighting Movie Maker Learned the Five Keys to Closing America's Education Gap, M. Night Shyamalan suddenly found himself at the head of an inner-city school English classroom. And he was terrified. "Time stopped," he writes, "similar to when you are on a plane with turbulence that's supposed to last thirty seconds, but it feels like much, much longer." To break the silence, Shyamalan boldly proclaimed that he's the highest paid writer, word for word, in the world, and then he asked the students how they thought he's managed to pull that off. One kid assumed the Academy Award nominated director had connections. Another chalked it up to dumb luck. Nope and nope. "No one on this planet can write me better than me," Shyamalan finally told them. "That permission to be okay with my flawed, misfit self in my scripts has made them stand out." That's a pretty good way to think about I Got Schooled. The author's flawed voice is front and center early, and he sounds like a bore. "One thing you need to know about me is I'm seriously, clinically sentimental," he writes in the prologue. A few pages later, "Something you should know about me is that I'm a pretty selfish guy." He's also, he tells us, an "eternal optimist on steroids," "obsessive," a "dictionary fiend," and the kind of guy who agonizes over menus. But Shyamalan's voice also makes this book stand out. It's alive with the romantic conviction that America's education problems can be solved, and unlike many, he's not going to send us to Scandinavia to solve them. "One bit of advice I'm ready to share is this: whenever anyone brings up Finland, back away slowly," he writes. "In fact it mystifies me that a country with fewer people than Greater Philadelphia, no civil rights problem, and virtually no significant income inequality is held up as a model for the United States." I Got Schooled is a breezily written, research driven call to change America's approach to education. Shyamalan is smart and sincere, and his innovative ideas are unbound by the educational establishment. The author glimpsed America's education gap in 2007 while scouting Philadelphia high schools for his film The Happening. His breakthrough moment arrived at a dinner when Penn Presbyterian Medical Center's chief medical officer explained that — if strictly adhered to — a regiment of balanced diet, good sleep, exercise, no smoking and stress management "beats every pill" when it comes to keeping patients healthy. Shyamalan thought there must be similar tenets that would restore the health of our ailing schools. After four years of research and a lot of work with experts, he says he's found them: No Roadblock Teachers, The Right Balance of Leadership, Feedback, Smaller Schools and More Time in School. 'Eco-Horror': Green Panic on the Silver Screen? The book debunks several myths. Perhaps the biggest is the notion that smaller class size makes for a better education. Politically, Shyamalan points out, this plays very well. When California teachers' unions demanded higher pay in 1991, for example, then Governor Pete Wilson fought back by going on a teacher hiring spree. More teachers, smaller classes. This allowed him to spite the unions and score huge political points with voters, who intuitively assumed that smaller classes meant better education. The numbers, however, don't back that up. Shyamalan cites a 2000 National Bureau of Economic Research study that states the average American class size in 1960 was 25.8 students, and it's been dropping ever since. If the trend continues, by 2017 a student in an average classroom could have as few as 15 classmates. "You could even argue," Shyamalan writes, "that the real problem with advocating for smaller class size is we've already done it." Shyamalan believes all five of his tenets must be followed together to effect change, but he does stress the importance of good faculty, which sometimes means addition by subtraction through a new "evaluation system that permits schools to terminate teachers who are just not up to the challenges of instruction." Such a system could never be perfect, he concedes, which means some promising teachers would be shown the door. "But in the real world, the system doesn't have to be perfect," Shyamalan writes. "It just has to recognize that the needs of America's students have to come first, even if the cost is some unfairness."